Enjoy a taste of rural southern Arizona with a pair of summer harvest festivals! The fledgling Arizona wine industry has been centered around the tiny, quaint villages of Elgin and Sonoita, the location of Arizona's first winery, Sonoita Vineyards. Each year, Sonoita Vineyards celebrates its harvest with Augustfest. The festival features great food and wine plus activities in a beautiful rural setting. The event is generally scheduled the first weekend of August, this year, August 4-5, 2007. Much of Arizona's fruit and vegetable farming takes place in the Sulphur Springs Valley, around the town of Wilcox which is about 75 miles from Sonoita. 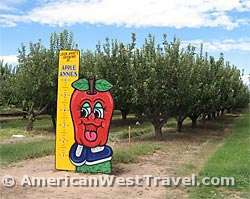 The most well-known concern is Apple Annies Orchard and Produce Farm which features pick-your-own produce and a series of festivals summer-long. Apple Annies most popular event is the Peach Mania Festival which runs on weekends from mid-July through mid-August. The festival also includes a Country Crafts Fair generally scheduled the first weekend of August, this year, August 4-5, 2007. Coming from Phoenix, we generally make a weekend of it. It's a three hour drive to Sonoita Vineyards where we attend Augustfest on Saturday. 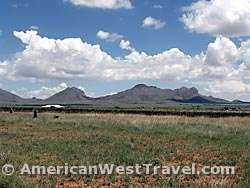 There are excellent overnight bed and breakfast options around Sonoita. 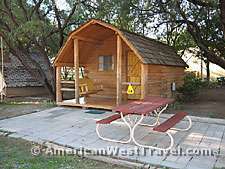 We continue on to the town of Benson (en route to Apple Annies) where there is a very rural KOA (Kampgrounds of America) offering inexpensive but comfortable "Kamper Kabins" (photo, right), where we stay the night. The rural setting is quite pleasant and in keeping with the nature of the weekend. On Sunday morning, it takes less than an hour to reach Applie Annies which is just north of Wilcox. The return to Phoenix from Wilcox is about four hours. The authoritative guide to outdoor adventure in the wild and beautiful Grand Canyon State. In Wildflowers of the Desert Southwest, Meg Quinn helps even the most amateur botanist to identify more than eighty-five of the most common and showy species found in the Sonoran Desert. Everything you wanted to know about the Sonoran Desert. Arizona's Sonoran Desert runs roughly from the foot of the Mogollon Rim to the Mexican border. The desert exists generally at elevations lower than 4,000 feet. The many low desert mountain ranges create a wide variety of terrains and experiences. The Sonoran Desert encompasses the southern half of Arizona. Most destinations are readily accessible from Phoenix and/or Tucson, from Interstates 8,10,17.